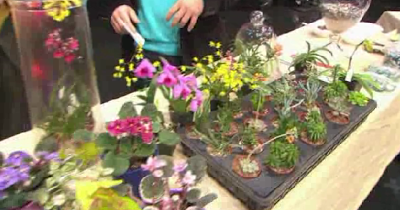 I'm not going to embed the video as it pre-loads with commercials in it, but hop on over to WGNTV.com to see a fellow from TUBLOOM Garden & Landscape Design demo some terrarium stuff. The terrarium tips are pretty basic but peep that bevy of showy miniature orchids and other fun, small terrarium plants! I've met many terrarium enthusiasts that are excited to try orchid terrariums - but often don't know where to start. It is a process that I myself have attempted and failed at (read more about my trials and tribulations here). Perhaps a great way to start is a quasi-terrarium for a small orchid. In the above screen capture you can see the tall apothecary jar, which is used to house two tall orchids that are in small pots. Then look at this teeny-tiny orchid! I've only seen varieties this small for sale at orchid shows. If you know more about what it is or where to find it- let's hear it in the comments! love that tiny orchid! what type is it? This is probably very late, but I think that is Ceratocentron Fesseli, or one of its hybrids, Tuberocentron "Niu Girl". Actually, looking closely at the label I think it's the Tuberocentron. They're extremely hard to find nowadays, and I've been looking for them for months. Thanks- that is good to know. 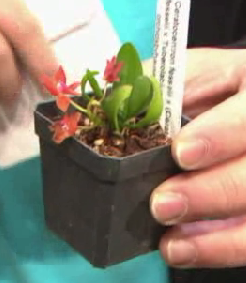 Do you grow small orchids in terrariums? That is Ceratocentron fesselii × (Ceratocentron fesselii × Tuberolabium kotoense) a very rare hybid. I have this one and it is quite finiky:-(. I have seen them for sale at Peach state orchids.